It’s the middle of October. Temperatures are dropping, leaves are changing color, and pumpkin beers have hit the shelves with a serious vengeance. By no means is pumpkin beer a new thing in the U.S., but this year there seems to be such a glut of them I’m starting to wonder if there’ll be any pumpkin left for the ailing pumpkin pie industry. But just because there are more players in the pumpkin beer game, doesn’t mean that they’re all winners. Of course depending on who you ask, they might tell you that there are no winners in the pumpkin beer game because they despise, detest, or otherwise deplore pumpkin beer. And depending on which pumpkin beers they’ve had, I can’t say I blame them. But before we get to this year’s countdown, let’s talk briefly about the perception of pumpkin beer and then our ranking method. Quick question: If you had to guess what most people in North America think pumpkin beer should taste like, what do you suppose they’d say? Like pumpkin pie maybe? If so, people are often quick to point out that what you’re tasting in pumpkin pie isn’t just the pumpkin, but also pumpkin pie spices like cinnamon, nutmeg, allspice, ginger, clove, mace, etc. (not to mention the pie crust and maybe some whipped cream if you’re fancy). Pumpkin on its own, depending on the variety and how it’s cooked, can taste like squash (it is squash), earthy, buttery, mildly sweet, and perhaps nutty, but certainly not like cinnamon or any of the other pumpkin pie spices. But because pumpkin pie is commonly how we encounter pumpkin in North America, it makes sense that we associate pumpkin with pumpkin pie, particularly pumpkin pie spices. 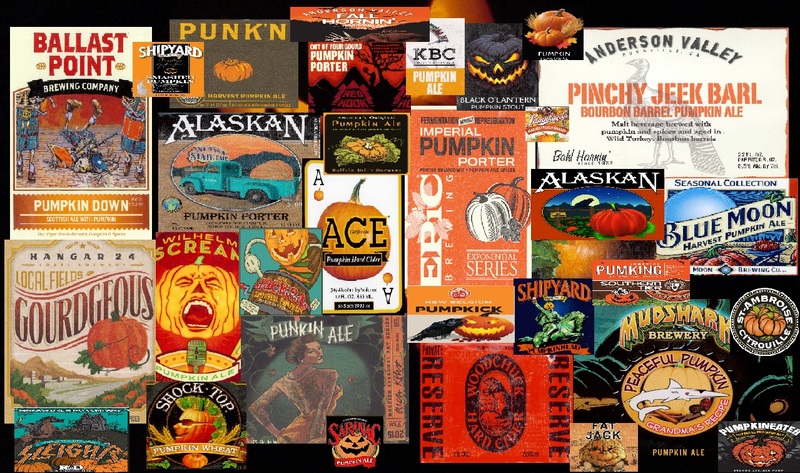 Many breweries take this into account, especially those producing pumpkin beers for a North American audience, which is why some “pumpkin” beers can get away with containing only pumpkin pie spices and no actual pumpkin at all (sort of like how Starbucks’ Pumpkin Spice Latte doesn’t contain pumpkin— at least not prior to this season). That said, using pumpkin pie spices in a pumpkin beer (with or without the pumpkin) can be a double-edged sword for brewers because not only does it reinforce the stereotype that pumpkin beers should be spiced, but also the consumers’ expectation that pumpkin beer should taste as close to pumpkin pie as possible. Speaking of how pumpkin beers “should” taste, here’s the other important thing you should know about the squashy suds: Brewers, particularly those of the pesky craft variety, sometimes think that it’s OK to be creative and add pumpkin or related spices to different styles of beer like porter, Scottish ale, Altbier, saison, and even Lambic, which can definitely stretch some preconceived notions about what pumpkin beer is, especially when executed well. For the purposes of this review, even if the beer in question was delicious, well balanced, etc., points were taken off if the pumpkin beer did not exhibit any “pumpkin” character. And we were very open with the interpretation of “pumpkin” character and didn’t mark off points as long as the beer exhibited at least one of the following: pumpkin/squash character, pumpkin pie character, and/or any pumpkin pie spice character; otherwise we more or less followed a combination of the GABF Pumpkin Beer guidelines and the 2015 BJCP “Autumn Seasonal Beer” (30B) guidelines, meaning that beers were judged according to an external standard more so than personal taste. The other important thing to keep in mind when using the BJCP (Beer Judge Certification Program) model to evaluate pumpkin beer is that the quality of the base beer in question greatly impacts the total score of the pumpkin beer, so if the underlying base style is not brewed within the BJCP/GABF guidelines (i.e. brewed “to-style”), then the overall score suffers (the inverse of this is also true). All beverages were carefully evaluated by a panel of experienced homebrewers and tasters, most of whom have over ten years of experience evaluating beers (using the BJCP scoring method). In the interest of objectivity, all beers were evaluated over several tasting sessions (no more than one session per day), and in most sessions only three beers were evaluated so as to avoid palate fatigue (i.e. getting tipsy). As much as possible, pumpkin beers with a similar base beer (porter, wheat beer, etc.) were sampled during the same session. Each beer received approximately 10-15 minutes of evaluation time which covered appearance, aroma, flavor, mouthfeel, and overall impression. Beers were evaluated in clear glass Brandy snifters in order to emphasize the beer’s character. Beers were served at the recommended serving temperature if one existed on the bottle/can; otherwise the beer was served at approximately 48-50°F (8.9-10°C). All beverages reviewed were purchased out-of-pocket from retailers, which on one hand might lend more impartiality to the reviews, but on the other hand means some pumpkin beers didn’t make the list for no other reason than we’s only gots so much cash and because we were limited to mainly beers that are available in our region (west coast). This means that although SCHLAFLY PUMPKIN ALE is highly acclaimed throughout all the galaxy (or whatever “the best” pumpkin beer in your region is), because they do not distribute out west, they do not show up on this list. Also, even though the beers were consumed shortly after purchase, we can only assume freshness of the sample if there is no date listed on the bottle. Just for fun, we also reviewed a few pumpkin ciders.